Vincent is nearly forty years old, with little to show for his life except his precious sixteen-year-old daughter, Gemma: sensitive, insightful and wise beyond her years. When a stranger crashes her car outside Vincent and Gemma's bush home, their lives take a dramatic turn. In an effort to help the stranded woman, father and daughter are drawn into a world of unexpected and life-changing consequences. 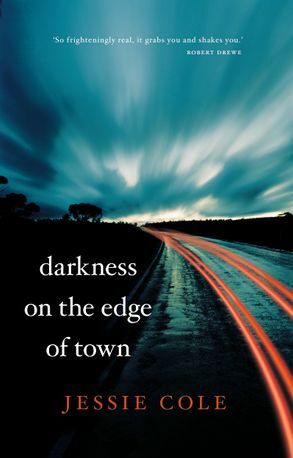 DARKNESS ON tHE EDGE OF tOWN is a haunting tale that beguiles the reader with its deceptively simple prose, its gripping and unrelenting tensions, and its disturbing yet tender observations. Jessie Cole was born in 1977 and grew up in an isolated valley in northern New South Wales. Her debut novel, Darkness on the Edge of Town, was published in 2012 to critical acclaim, and her work has appeared in Kill Your Darlings, Meanjin, Island Magazine, Daily Life and The Guardian. Nowadays, she lives in her childhood home with her two sons.